It is also called BAlushAhi, PAdushAh and BAdushAh. All mean the same item. Sieve maidA and mix it with ghI, curd, ¼ cup sugar and baking soda well in such a way so that the mixture should remain together if pressed and loosen if just tapped. If not, you need to add a little more ghI. Add a little water and make thick dough. Now pour the oil into a kaDAi and heat. Drop a little of the dough and if it puffs up immediately when being fried simmer the flame. Now, take big lemon size dough, press into a round shape with a dimple in the centre and fry. In this way fry the entire dough. Make syrup from the remaining sugar (1½ cups) by adding it to the same quantity of water and boiling to 2 string consistency (i.e. it should crystallise after a couple of minutes when a little drop is poured on a plate). Add either cardamom powder or rose essence to the syrup and mix well before putting off the flame. Either smear the thick syrup on all sides of each bAdshAh or place at a time a few in the syrup for 2 minutes and remove. This way after removing arrange them on a plate. Store in an air tight vessel. Garnish each at the centre with pistA shreds when serving. The item, having the same stuff gets its name differently as per its shape. 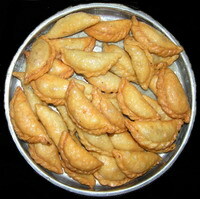 If in circular form it is SUryakalA and if in half circular form it is CandrakalA or SOmASi or KaranjiA. The filler may be either pure unsweetened KhOA or other ingredients sans KhOA. Make dough with MaidA, salt, and a little oil. Instead of MaidA, some people use ATTA (wheat flour) also but it is not advisable since it is not only reddish but also not tasty. Keep the dough in a closed vessel for ½ an hour. 01. If you use just khOA fully, then roast it to loosen like sand. Allow it to cool. When it is not warm but cold add sugar to it and mix well. If sugar is mixed when it is hot, it will melt and make the filler sticky and spoil it. 02. If you do not want to use khOA or do not get it (of course you can make it by heating good milk continuously and stirring constantly till it becomes very thick like dough) you can make the filler this way. Break the nutmeg, almond and cashew nut into small pieces and grind with the poppy seeds and roasted split gram dAl for a second. Add pistA shreds to this coarse mixture. Grind ¼ cup sugar with cardamom seeds into fine powder. Add this to the mixture. If you use rose essence, then you need not powder the sugar with cardamom but directly powder without it. Now make the dough into small balls, and roll them to make circular pUris. 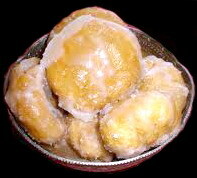 Alternately, you can divide it into big balls, roll them into big discs and cut each with a small round lid into pUris. 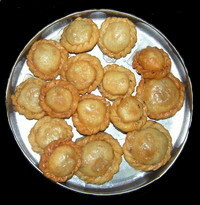 Each pUri may be of about 2 to 2 ½ inches in diameter. In the centre of each pUri, place 1 table spoon of the filler (either the khOA or the mixture) and close it in the form of a semi circle by folding it. You must close the edges so that they do not open when fried and spill the filler into the oil. For this wet your fingers with a little water and press well. Now use a mould available for sealing the edges or just fold and press continuously. If you place the filler in between two discs and then fry after sealing the edges in circular form, it is called SUrya kalA. After keeping ready all the karanjiAs, fry them in batches, in oil, to golden brown colour, turning upside down to fry both sides. You can also take the hot oil in the ladle used to turn over and pour over the turned side if the karanjiA does not dip inside the boiling oil. Remove from oil, strain excess oil placing over a strainer and then keep aside on a plate. Some people just powder extra sugar and smear all sides with this. But the karanjiAs will not last longer. Similarly if you use dried coconut (Copra) as one of the ingredients of the filler, then also the shelf life will be just for 3 to 4 days. Prepare two string sugar syrup with the help of remaining sugar and 1 cup of water. When it is cooled, add a little rose essence, if cardamom is not added. Then smear each KaranjiA/CandrakalA /SUryakalA with syrup on all sides and cool. This entry was posted on October 15, 2011 at 7:53 pm and is filed under Thamizh Festivals with tags all purpose flour, badhushah, badshah, baking soda, balushahi, cardamom, cardamom powder, cashewnut, chandrakala, Deepavali, Dipavali, Diwali, ghee, karanjia, khas khas, khoa, khus khus, koya, maida, mava, nutmeg, padhushah, pista, pistachio, poppy seeds, pottukkadalai, refined oil, roasted split gram dAl, rose essence, salt, shredded pista, somasi, sooryakala, sour curd, sugar, suryakala, sweets, Tamil festivals, Thamizh. You can follow any responses to this entry through the RSS 2.0 feed. Both comments and pings are currently closed.